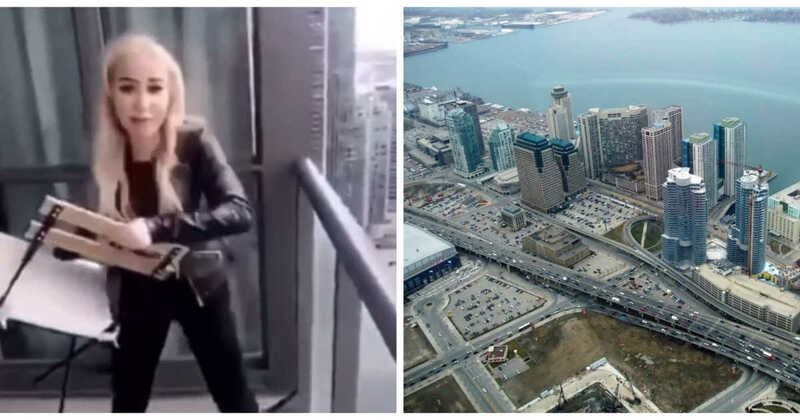 The Toronto Police Service is investigating after a video surfaced online showing a woman throwing a chair from a condo balcony near the Gardiner Expressway. The video, which appears to have been shot at a building in the area of Harbour Street and York Street, shows a young woman standing on a condo balcony holding a chair. The woman proceeds to toss the chair off of the balcony, which is located on a high floor of a building above the busy highway. Police say they believe the incident occurred on Saturday at around 10 a.m. In a news release issued Monday, investigators noted that other items were thrown off of the balcony as well. All of the objects landed in front of the entrance to a condo building in the neighbourhood. The chair was later found on a sidewalk damaged “almost beyond recognition,” Const. David Hopkinson told Webtopnews on Monday. It does not appear that any vehicles were damaged or that anyone was injured by the falling objects. “We are talking 30 floors up, a metal chair, in front of a condo building where anybody could be walking under it,” Hopkinson said. Police have not yet identified the woman in the video but believe she is in her 20s and is approximately five-foot-one to five-foot-two. She is approximately 110 pounds, has a slim build, and long blond hair. She was wearing a black leather jacket, black clothing, and black high heels at the time of the incident. Police have now released a photo of the woman and are asking the public for help identifying her. Hopkinson said as part of the investigation, police will be speaking with staff working at the concierge of buildings in the area. The woman is facing a charge of mischief, endangering life, police confirm. Anyone with information about the incident can contact police or Crime Stoppers anonymously.